To Chichester, staying with Mary, Nick & Laura. They've done a terrific job on the house they moved into just over a year ago, not far from the excellent Pallant House. And 100 yards from that gallery is this mural (or graffiti, depending on your point of view). 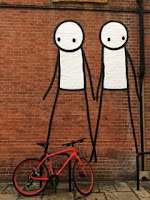 It's by an artist called Stik who some tip to be the next Banksy. I don't know about that - his work is very simple, always stickmen - but I'm an adherent. Some of them are enormous, like Big Mother, which adorns an old Council block of flats in London - at 125ft, the tallest street artwork in the UK. 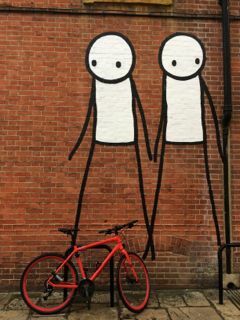 This more modestly suited example one was done for Chichester Street Art Festival in 2013.